For an unforgettable evening of dining beneath the stars you come to Restaurant Ginger! A combination of colonial hip and lounge style, Ginger mingles exotic spices and ingredients from Asia, Indian and the Caribbean. The food is delicious, and garnished beautifully with vegetables, herbs and spices. The taste is eclectic and represent a fusion of culinary traditions from around the world. Click here for our Menu! A hot spot, hidden, but not to be missed! Asian Cuisine is extremely popular in the Caribbean today, both among locals and tourists. Authentic Chinese recipes such as Char Sui and Indian Delicacies such as Chicken Tandoori have pervaded the local cuisine. Ginger has adopted the secret of culinary success in the Caribbean with a few of Asia’s sensational recipes! Restaurant Ginger is situated in the historic surroundings of Pietermaai Smal and located within walking distance of the city center (Punda). This makes Restaurant Ginger an excellent destination after a day shopping or sightseeing in Willemstad. 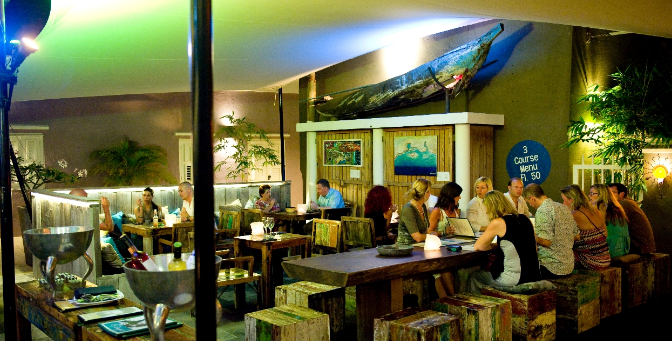 Opening hours Restaurant Ginger Curacao: Daily from 5 pm till midnight.